Redefines the underspin to a new level. With a specially designed planner head, positioned rearward, coupled with a unique 28 degree EWG hook and bait screw-lok keeper, this is quite naturally the best running of all the various underspin's on the market today. 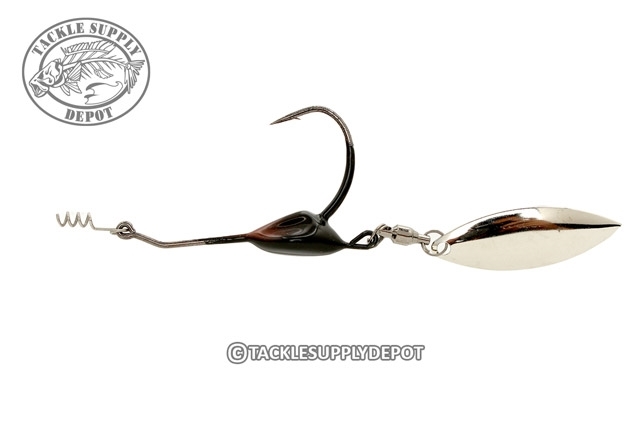 Venom offers this new bait in two blade configurations; the Thump n Turtle and a standard Willow Leaf. For the stealth and flash approach, the Willow fits the bill nicely. Conversely, for the folks and fish that prefer more vibration and flash, then the Turtle Blade will make your rod tip thump. Use with a myriad combination of baits; Venom's Buzz Tail Shad, Venom's Skip Shad, both 4 and 5 inch versions, the Rapid Tail Shad, and that's not to mention the Producer Smallmouth Grub, Bully Frog and 5 Piggy Grub. The head design is such that you can control the depth of retrieve without fear of it "rising" on you, nor does it have the inherent weaknesses associated with the front weighted style of underspin, it takes the best of the various designs and perfects them to a new level.